In the following letter to the editor, Wendell Berry—the 82-year-old Kentucky farmer, novelist, poet, humanitarian, environmentalist and all around agrarian icon—responds to a New York Review of Books essay that, in his view, exemplifies what big city liberals continue to get wrong about rural people, culture, politics and the economy. The story that prompted Berry’s well-mannered but caustic response was written by Nathaniel Rich, the 35-year-old son of former New York Times columnist Frank Rich, and originally published as the foreword to a new book by Joan Didion titled South and West—a collection of notes, interviews and observations spanning the legendary 83-year-old writer’s early travels and career. This misguided conventional wisdom, Berry argues, conveniently ignores the decades of destructive economic forces rural communities have endured since the Eisenhower administration—a crony-capitalist-facilitated “plundering” of everything not tied down—and the absence of any effective political response from Democrats in Washington. Sympathetic pandering? Yes. Results? Not so much. What is remarkable about Mr. Rich’s essay is that he attributes the southernization of rural America, and the consequent election of Mr. Trump, entirely to nostalgia “for a more orderly past,” without so much as a glance at the economic history of our actual country. The liberals and Democrats of our enlightened cities, as Mr. Rich rightly says, have paid little or no attention to rural America “for more than half a century.” But it has received plenty of attention from the conservatives and Republicans and their client corporations. 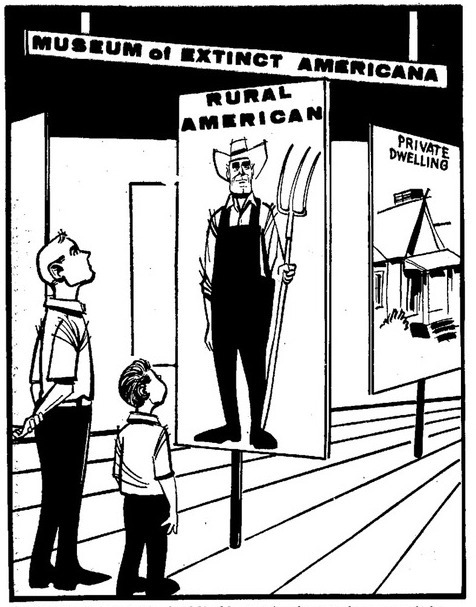 Rural America is a colony, and its economy is a colonial economy. In a New York Times Op-Ed, A. Hope Jahren writes: “Farm policy hasn’t come up even once during a presidential debate for the past 16 years.” But the problem goes back much farther than that. It goes back at least to Eisenhower’s secretary of agriculture, Ezra Taft Benson, who instructed American farmers to “get big or get out.” In effect that set the “farm policy” until now, and thus sealed the fate of the decent, small, independent livelihoods of rural America. To that brutally stated economic determinism I know that President Clinton gave his assent, calling it “inevitable,” and so apparently did Mrs. Clinton. The rural small owners sentenced to dispensability in the 1950s are the grandparents of the “blue-collar workers” of rural America who now feel themselves to be under the same sentence, and with reason. It is true that racism, sexism, and nostalgia have counted significantly in the history of rural America until this moment. But to attribute the approximate victory of Mr. Trump only to those “southern” faults, and to locate them only in rural America, is a driblet of self-righteous ignorance. In Rich’s defense, the United States has an undeniably racist origin story, one that continues to explain a lot about how we interact with each other. But if only to prevent it from ever happening again, both writers would probably agree it’s important for our historical record to accurately diagnose Donald Trump’s ascension. This requires acknowledging that, unlike Bernie Sanders, Hillary Clinton failed to make a compelling economic case to millions of Americans who are finding it harder and harder to get by. Lies or not, Trump did. Identity politics aren't going away. We're grappling with a karma-guided hatchet that’s nowhere close to being buried. Unfortunately, ignoring the pain associated with that reality lends itself perfectly to the president's (seriously stupid) #MakeAmericaGreatAgain hashtag. That said, blaming rural Americans for temporarily swooning over the off-the-cuff brilliance that was “Drain the Swamp”—essentially a promise to a serially ignored segment of the population that, this time for realsies, things will change—is not productive or progressive. We are, after all, dealing with a political establishment that has for decades been losing sight of what “We the People” means. And none of this changes how fast Trump-the-candidate’s “America First” rhetoric magically (freaking seamlessly) morphed into more foreign interventions, a cabinet stacked with "statesmen" courtesy of Goldman Sachs and a torrent of policy proposals that clearly favor the rich. On second thought, perhaps it’s time for all Americans—the disappointed, the still-stoked and the terrified—to start focusing not on how this happened and who's to blame (the diagnosis) but on what comes next. In other words, what’s the prognosis? To read Nathaniel Rich’s reply to Wendell Berry’s letter, click here. I think I hear you shastatodd, but can you hash out the "limits to growth" elephant for my friends who don't? this is NOT political, it is math and science. Well if the premise of Berry's argument is that Rich's "conventional wisdom conveniently ignores the decades of destructive economic forces rural communities have endured since the Eisenhower administration—a crony-capitalist-facilitated “plundering” of everything not tied down—and the absence of any effective political response from Democrats in Washington," than I agree. This isn't city boy versus country boy. This is capitalism and its voracious appetite to devour all small companies, industries, storefronts and shops (farming included) to maximize profit over all other values and siphon that profit out of communities. It seems in America it is anathema to call out capitalism for what it does (e.g. Nancy Pelosi's "we are a capitalistic country) to working people no matter what industry. The financial and industrial giants now rule our government and do so unashamedly. Where they once pretended to care about our nation because they were held in check by a working class that took to the streets in the Great Depression, they plutocrats have dispensed with all pretense and ignore any niceties they found necessary. Working people in the de-industrialized and decaying cities of Ohio (Dayton, Youngstown, Toledo, Akron, Cleveland) have much in common with their rural brothers and sisters in the state. For once it would be nice if the Democratic Party supporters see the real movers behind what is going on and not blame the supposed "deplorables." Democrats rode the Newt Gingrich wave with Bill Clintons political skills. The Rush Limbaugh/ Fox News factless assault on truth abetted by the Koch bros and their like has continued.... The Democrats (Hillary for example..) put their feet in the swamp and got more and more sucked into the morass while the Republicans live there. They are happy there. Democrats held their nose and got along somewhat. Along comes Trump and suddenly the Democrats get all the blame. Now I like Wendell Berry. BUT...his rebuttal is beside the point however eloquent. There are plenty of Democrats in these rural states. They didn't vote for Trump. They liked Bernie's message. Trump is the blind mouse that found the cheese, when he co opted Bernies message. Clinton's problem was that she had baggage smeared over her by the Rush/ Fox media machine and that she defeated Bernie and that she is a woman. Now we have Trump and his cronies. We are so close to all of us getting screwed. Thank God he keeps shooting himself in the foot. I live in the rural South. .People are scared and desperate. You used to be able to get by..Not do great but get by. Now it's getting hard to do that.